DUBAI JOB INTERVIEW POSTED.ONE OF THE LEADING COMPANY CONDUCTING INTERVIEW FOR DUBAI JOB. 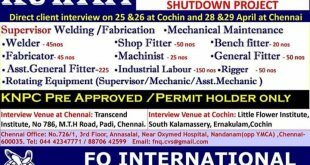 INTERVIEW IS SCHEDULED IN COCHIN.REQUIREMENTS IN LARGE NUMBER. LIST OF VACANCIES ARE GIVEN BELOW. 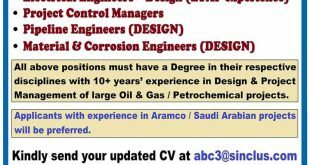 SEND THE CV TO GIVEN MAIL ID.MORE INFORMATION CONTACT THE PHONE NO. I am a Mechanical Engineer with 2 years experience as PPC-Engineer as well as Technical Project Associate for Engineering product like automobiles. Now I am eagerly willing to work in dubai. Will you givea chance to work there! I’m a BE Mechanical Engineer 2013 passout I’m presently doing a shutdown in Qatar @ Ras gas. I have been working in Cement Industry now as a CCR OFFICER (PYRO PROCESS) I kindly requesting you, give me a chance in abroad. Thank you Sir. I completed BE Mechanical Engineering. I had 2 years Experienced in Automotive production company. I know to work well in CNC and VMC Machine process as well as doing as a Quality. I know to handle the measuring instrument. I eagerly to work in abroad any chance to give me. I am a diploma mechanical engineer with cnc programmer. 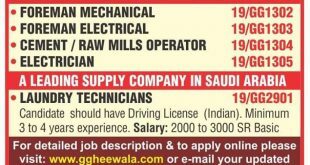 I want to do job in Dubai so please help me. Sir I am devendra kumar mishra 8 years experience in construction field. So plz any are job inform me Sir. i have 25 years experience in fabrication supervisor,piping supervisor,fabrication planing if have any requirement send me email. I HAVE EXPERIENCE IN PIPING FITTER AND FABRICATION AND SUPERVISOR AND CO PRATE THE QC. I have 5 years experience as Camp Administrator in Abu Dhabi. If any requirement as camp Administrator please try to contact me.